'twas a gloomy Saturday morning when i woke up...to my surprise, it was again raining when it was already sunny the previous day. i reached for my phone and read a friend's message that said, "Goodbye, tita Cory..." i nearly choked. she may not be one of my family, but with her legacy of bringing back Democracy in our country made me feel like i'm one of hers. her concern for everybody, be an enemy or not is so genuine...and her faith in God is overhelming and truly something to be admired. 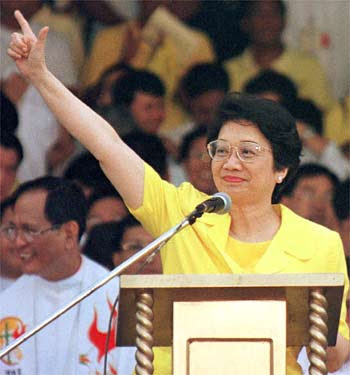 i was only 6 years old when she became Asia's first female president, and the Philippine's first...but i already have an idea who she was back then. I saw the news (or probably some commercials) about the People Power and how Filipinos fought for the long sought after freedom after being under a dictator for more than 20 years. i remember how i love the songs that came up during that revolution...i might have a little idea of what the songs were about, but when i see and hear people singing it while marching hand in hand in Edsa, i know it's something bigger than its nice melody...and that there is something in those songs that make the people brave in facing those armed soldiers...and give them rosaries and prayers in return. her presidency might have ended a long time ago...but she never disappeared. she continued to be an icon of faith and not depending on violence in time of turmoil but on prayers. she was like a mother to all of us, for she continued to pray for our country. she's strong...very strong. imagine, being a widow after your husband got assasinated and yet, not showing any sign of hatred to those who might have caused it. she took over a very troubled and poverty-stricken country, and tried with all her might to get us on our feet and start all over again. she is one symbol of a very strong and great woman, despite all the obstacles that she faced. it was sad that she have left us...but i am also happy that she's now at peace with the Lord and with her beloved husband, Ninoy. i know she will forever be with us and will continue to pray for all of us, above. thank you very much Tita Cory and may you rest in peace.